While checking out FFANY (shoe show), I ran into the pink Ryka Truck which gave passersby a chance to spin to win a pair of Ryka sneakers, t-shirt or water bottle. 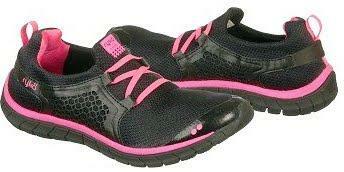 I was lucky enough to get a pair of the above Ryka Desire Running Sneakers. These lightweight (and I mean lightweight - my cellphone is heavier), breathable, synthetic and mesh sneakers features an elastic lace-up front for extra secure fit, cushioned Ortholite(R) insole for long lasting comfort, air flow for cool feet, odor and fungus inhibiting and keeping away moisture. This neon pink and black slip-on sneaker (available in Aqua/Silver/white and Blue/Neon Yellow) also features a lightly padded tongue and collar, Injection 3d Foam traction outsole with multi-angular flex sipes and a high rebound foam midsole, making this shoe a perfect walking or running shoe.